The zoo has welcomed eight tapir calves since 2007 in a bid to help the rare species. A rare Malayan tapir has been born at Edinburgh Zoo. The birth is the latest chapter in the Royal Zoological Society of Scotland's success story with this endangered species, with the zoo having welcomed eight tapir calves since 2007. Malayan tapirs are increasingly threatened in the wild by habitat loss and hunting so the European conservation breeding programme plays a key role in protecting the species from extinction. 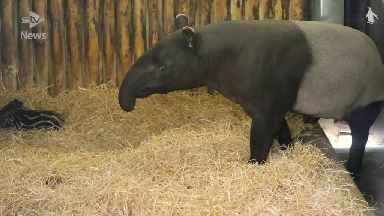 Jonny Appleyard, team leader for hoofstock at Edinburgh Zoo, said: "Malayan tapir populations in the wild are continuing to decline, so all births are incredibly valuable to the breeding programme and we're really excited about our latest arrival. "At the moment he is staying very close to mum Sayang but will soon find his feet and start to follow her outside." The baby tapir will be named by public vote from a shortlist put together by RZSS patrons.